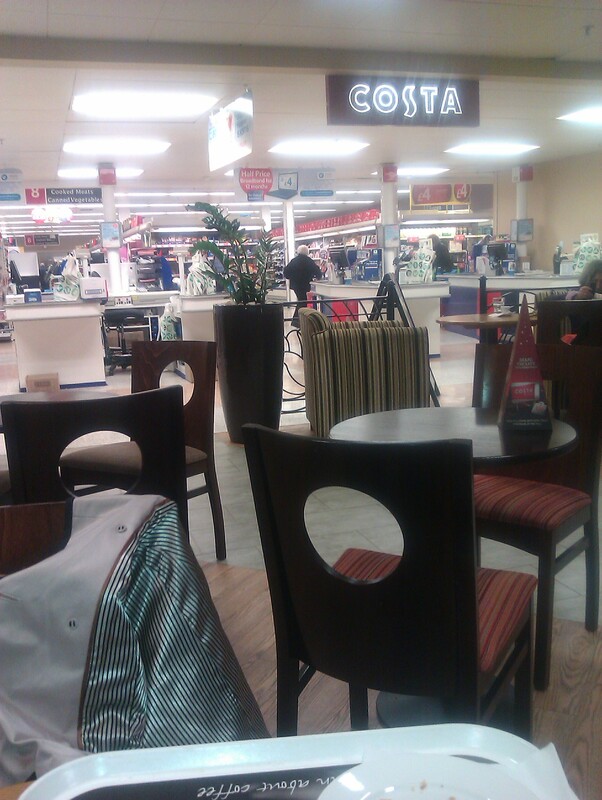 Despite being buried in the back corner of the supermarket, the surroundings were instantaneously Costa. The comfy seats, the layout of the coffee bar and the decor. Looking out from my safe seat I could watch people shopping and working whilst I enjoyed my Rich Hazelnut Latte (lovely) and read, surrounded by a few individuals doing the same. We had all sat a respectful distance apart so as not to get in the way of each other, united by our common purpose of coffee and reading, but that was as far as it went. It got me thinking about safe havens but then I saw a metaphor for the church. Here I sit in my “comfy, recognisable, safe” surroundings doing my own thing with a bunch of relative strangers who are all doing their own thing, united by one thing, yet not interacting unless necessary, watching or ignoring the busy world only yards away. The Discipleship movement that is going on in Forth St Paul’s is about leaving the coffee shop and entering the supermarket and working with people where they are, rather than expecting the people to come into our coffee shop. The coffee shop, the Church will always exist because we all need a coffee break now and again, and we need the planners looking out seeing what needs to be done. But the supermarket was busier than the coffee shop and the real work was being done there. No matter how plush the surroundings or how lovely the coffee – unless people have time or know that they need God they won’t come into our church. Where do you find yourself? Always drinking coffee but never out on the shop floor? Do you want to get out? Do you feel God inviting you to join him on the shop floor but you are struggling to figure it all out? Don’t worry – when God invites you he will also give you purpose and identity. Let’s not give up and let’s escape the coffee shop and get down to the real work, knowing that the regular coffee breaks we will share will be all the more special, and eventually the hard work will be rewarded. God bless you this day and always, especially when you are working in his mission fields.